I can’t believe we’ve already reached the end of another year. This has been my blog’s 2nd year in existence and I’m proud to say that I was able to accomplish some things that might seem small to others but were a big deal to me. I started this blog as a way to share ideas that have been working well to keep my family organized, fit, fed and having fun. Everyone has their own thing that they are good at and staying organized, creating systems to make life easier, cooking, and creative, fun little ideas seem to be mine. My hope is that other people will find an idea that works for them to make their life easier or more fun. Happy people generate happiness. I also really enjoy the creative outlet of blogging and the fact that it helps me learn something new almost everyday. Something as little as learning how to adjust the spacing on my header and menu bar using html makes me feel SO accomplished and gets me excited. I know, I’m a total weirdo. In 2015 my goal was to see if I could come up with enough content to share on the blog for a whole year. Fortunately, I didn’t have a problem coming up with things to write about. This year my goal was to expand my reach and Pageviews. While my numbers are still very small, I’m happy to say my Pageviews increased over 300% from last year!!! My Pinterest, Facebook & Twitter following has grown and I joined Instagram! Some of the highlights of the year include participating in some very big Stitch Fix Giveaways with other bloggers and getting my 1st paid post! I also refreshed the look of the blog and have become much more organized in my approach. The Gift of Stitch Fix- My Sister’s 1st Fix! Stitch Fix Review #14 & a HUGE Giveaway! In 2017 I want to continue to expand my reach and start to earn a little extra income from the blog. I’ve been working on a product I plan on launching hopefully early in the year. I’ll be looking for some help working out the kinks. If you struggle with meal planning, can provide constructive feedback and would like to help out let me know! I’ll also be changing up the format of my Weekly Menus. 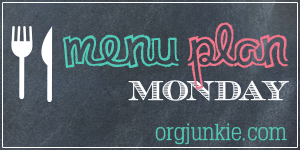 Instead of just posting a link to the menu, I’ll be creating a blog post for each menu. If you subscribe to the blog you’ve been getting a preview of what that will look like. I look forward to giving these things a try and letting you know how it goes. Mostly though I want to write posts that you want to read and that you find helpful. Let me know what you’d like to see on the blog in the coming year. Are there some things you’re curious about but want to see what someone else thinks first? I’m happy to try out new things and give you my honest opinion. Wishing you a Happy & Healthy 2017!